A sturdily bound set of course modules that lies flat for ease of study. 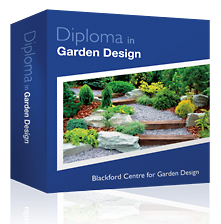 Detailed, practical information that guides you skilfully towards becoming a professional garden designer. 13 garden design assignments. Your assignments will be carefully marked with personal advice by an experienced tutor. 'Garden Design Made Easy' DVD, exclusive to the course. This gives you an easy-to-grasp overview of the factors involved in designing a garden (not in the online-only edition). A workbook for your exercises. A useful case which keeps all your course material (not in the online-only edition). Garden Design Software. We provide you with free garden design software, and video instructions on how to use it. It will help you produce beautiful and detailed designs for your clients. Don't want to learn computer aided design? We show you how to create straightforward garden designs in Microsoft Word. It's the ultimate guide to producing simple plans. A Guide to creating garden design plans in Microsoft Word (available nowhere else). This Guide shows you how to produce simple but effective plans using just Microsoft Word, a program you're probably quite familiar with. '49 Winning Ways to Promote your Service' booklet. Great ideas to get you started. This booklet is not available anywhere else. You get a free garden designer’s website, complete with sample text. Just change the text to suit your needs, upload it to your site, and you’ll have your own website! If you went to a designer, they would charge you at least £385 for this work. And because we know what clients want from an garden designer's website, the pages are better than what a designer would provide. Click here to learn more about the free garden designer’s website. Included in your course is a Garden Design starter pack. It includes clipboard, notepad, graph paper, steel measure and pencils (not in the online-only edition). 'Approved Garden Designer' logo for your website and stationery. Your name on the 'Approved Garden Designers' listing. The right to use the post nominal letters Dip. GD (BC) after your name.